Brunswick Heads is a small town on the north coast of New South Wales in eastern Australia. Twenty minutes North of Byron Bay it is too far out of the way for too many tourists so it is still a quiet little town. The river has three main tributaries that meet about three hundred metres from the ocean. One tributary goes north into the Billinudgel Nature Reserve that I have also written of, and the main one continues west inland to Mullumbimby. The third tributary turns south and disappears into wetland forest cutting off a huge section of land from the mainland, this is called Tyagarah Nature Reserve. The town itself is west of this third tributary and access to the ocean and beach is by a bridge across this third arm of the river. It is in this area that I met today’s subjects. I have been walking around this point along a well worn trail taking pictures and I have been meeting some delightful creatures. It helps that the place is frequented by people so the animals are less shy. 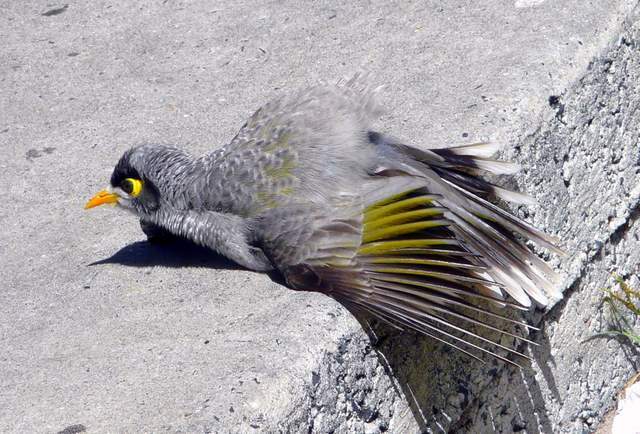 Yesterday I had been around the place and was varying my route when I came across a group of Noisy Miners preening themselves and sunbathing. And dustbathing. It was unusual that they let me stand so close, about two and a half metres, and showed no sign of anxiety at my presence. Though I didn’t test this too far. It’s mostly best to accept what is offered without trying for more. The dustbather was almost comical. 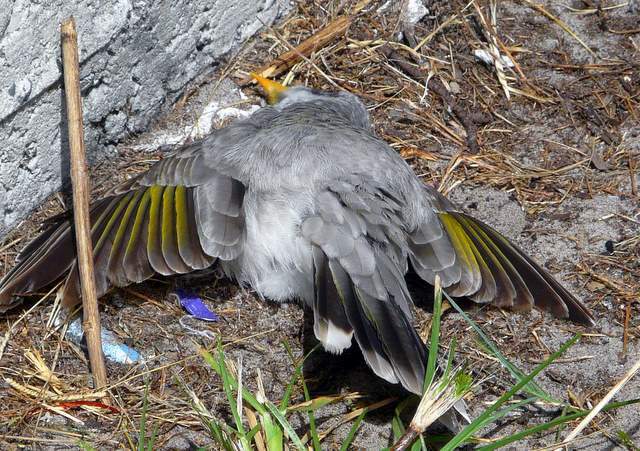 He was lying on the ground, wings spread and feathers fluffed up, trying to work himself into it with his wriggling and shivering. When another Miner came up to him he raised his head and repeated some small sounds over and over. Raising and lowering his head in rhythm. He was clearly enjoying his bath and was not to be disturbed, just like you and me. Only this was a bath of a different kind. 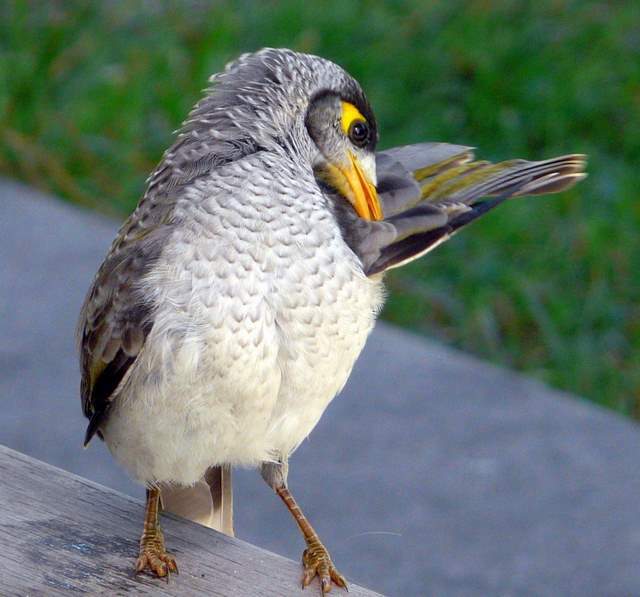 He was actually opening up his plumage to the ants and other predators of his parasites. Many creatures do this. They work themselves into the earth where the little creatures, like ants, live and agitate them so they go looking for the source of their discontent. On the way they pick off whatever lives on the bird that the bird doesn’t want there. How nature serves her own. 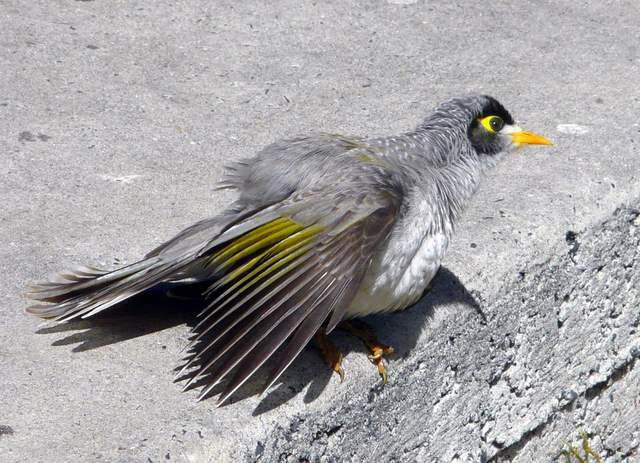 When he was done on the ground he was up to light bathe, spreading his beautiful feathers to the bright hot sun. He turned this way and that, making sure no place was left undone. It was a very thorough workout if you ask me. When he was done with the sun he was up on the table in the shade finishing off his ablutions. Fine tuning his cleanup and cooling down. It was delightful to watch, the uninhibited behaviour, of these god made creatures. Not a single thought for the onlooker. And safe in the knowledge of belonging and numbers. His mates would have given the alarm if there was any threat. 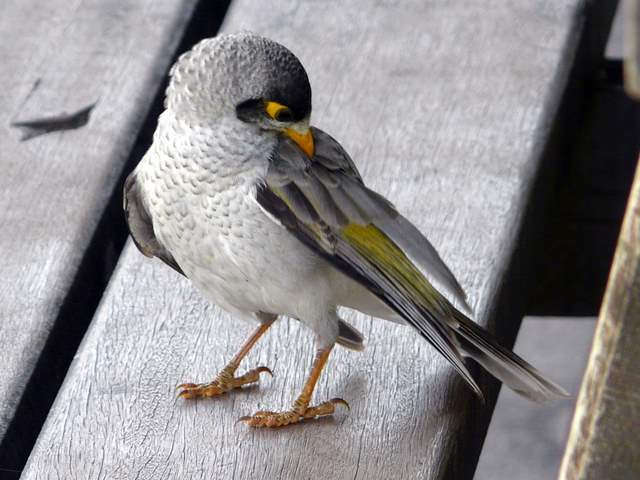 He was clearly at ease here by the picnic table near the river in this good Australian place.